According to a report on Tuesday, Apple has acquired a small startup called Matcha.tv, which provided a second-screen iOS app connected to various content outlets like cable TV, Internet streams and digital storefronts. Update: An Apple representative has confirmed the acquisition to AllThingsD. Citing people familiar with the buy, VentureBeat reports Apple acquired Matcha.tv for an estimated $1 million to $1.5 million. As part of the agreement, the firm's founders will be assimilated into Apple's team for at least two years. 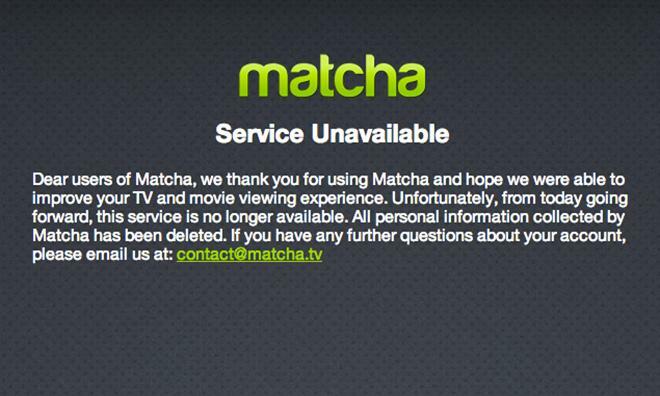 Shuttered in May, Matcha.tv was an aggregator for content from popular streaming sites, cable TV and digital video stores. The erstwhile app supported Netflix, Hulu, Amazon Prime, iTunes and cable networks like Comcast, among others. In addition to arranging content, users were able to manage viewed content and receive recommendations for future viewing. A social networking element was also included in-app to generate recommended media and provide a form of interactivity. While Apple has yet to implement any of the firm's technology into the Apple TV, Tuesday's news suggests Cupertino could have something brewing for an upcoming software update or even a new product. Apple has become increasingly interested in expanding its "beloved hobby" beyond its current capabilities. In June, a software update brought HBO GO, WatchESPN, Sky News and other channels to the small set-top streamer. More recently, a report claimed popular music platform Vevo is working on an app that will bring 24/7 music to Apple TV.